If you don’t own a culinary mandolin, use a vegetable peeler to get the paper-thin slices this recipe calls for. The inspiration for this salad comes from beef carpaccio, a classic dish of rare/raw sliced beef dressed in lemon juice, olive oil, capers and Parmesan cheese. The root vegetable version was invented by Chef Andy Hollyday of Selden Standard, named Restaurant of the Year 2016 by Hour Detroit magazine. It’s perfect for what’s coming in season right now — baby beets, beautiful radishes of every color, sweet turnips, colored carrots. The carpaccio certainly made an impression in March 2016 at several different demo venues. To make the vinaigrette combine all ingredients in a small mixing bowl or a mini-prep food processor, season with salt and pepper and whisk together. In another bowl add the shaved vegetables and enough vinaigrette to generously coat. If there is any vinaigrette remaining reserve for another use. Season the vegetables with salt and pepper and allow to marinate for 10-30 minutes, mixing once or twice. After 10 minutes, taste the salad again for seasoning. Distribute onto a large platter or on individual plates. Garnish with shaved Parmesan, capers, herbs of choice, and a twist of freshly ground black pepper. Serves 4-6. This delightfully colored and deliciously flavored salad comes from Yotam Ottolenghi, the Israel-born chef who’s become all the rage in the UK, where he has a half-dozen very popular restaurants, and in the US, where his books are selling like hotcakes (we admit, we have them too). 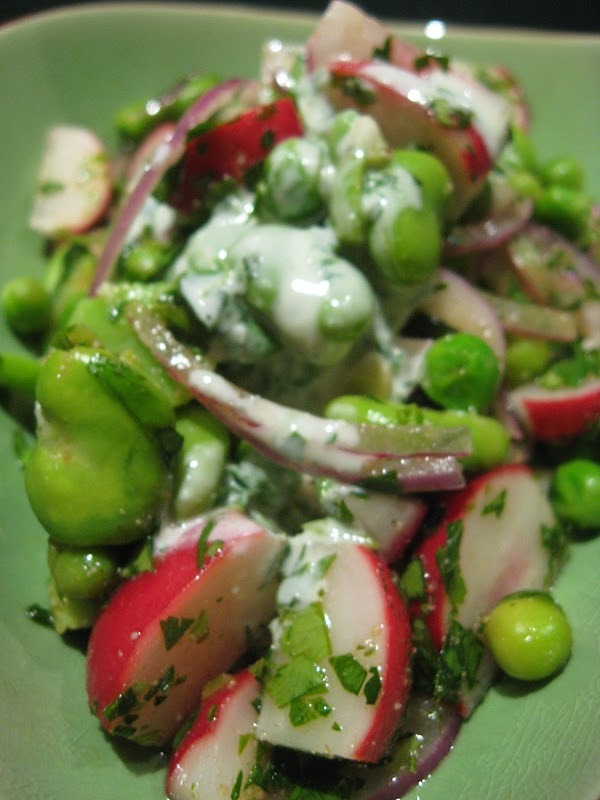 In this version, Danielle substituted edamame for the broad beans called for in Ottolenghi’s original. We now have a recipe for Preserved Lemons on the website — after many reminders from fans. Bring a pot large enough for the beans of water to a boil. Add the beans and simmer until tender. This will vary depending on the size of the bean and the type of bean using. Fresh limas will take about 20 minutes, frozen soybeans will take about 5 minutes. Once tender, drain and rinse under cold water. Cut the radishes into 6 wedges (or more if the radishes are very large) and put them in a serving bowl. Add the beans and all the remaining ingredients. Toss well, taste and adjust for salt and lemon juice. Serve with Green Tahini Sauce and pita bread wedges. To make the sauce, process all the ingredients in a food processor or blender until very smooth. Start with ¼ cup of water and add as needed. Taste and adjust for salt. Serve alongside the salad with pita bread. Sauce keeps well in the refrigerator for up to 2 weeks.